Whether you’re celebrating a religious holiday or Fesitvas* over the weekend, this "twist" on the traditional Eastern European babka cake - made infamous on Seinfeld's episode “The Dinner Party” - is a unique not-too-sweet chocolate and pistachio pastry to add to your table. I stepped out of my comfort zone with this post, and tried a recipe with yeast. I appreciated that instead of waiting for some scientific combustion of this mystery powder with warm water, the yeast was simply added to the bowl of dry ingredients. My first attempt to knead by hand didn't work, but the second try in my stand mixer with the bread hook got a pretty good rise on the dough. Please enjoy this version of the Seinfeld babka as it evolves from from cake to pastry to Paleo ~ and take a moment to have a laugh at the timeless humor of the gang at Jerry's. 1. In the bowl of a stand mixer fixed with the bread hook, add the flour, sugar, salt, cinnamon, lemon zest and yeast. Mix with a spatula. 2. Heat the milk to 115 degrees F. Add to dry ingredients and mix on low speed. Add the butter, one piece at a time. Add the egg and mix, adding the extra tablespoon of flour as required. The dough will be somewhat sticky but pliable. 4. About 15 minutes before the dough is ready, bring 2” of water in a pot to boiling. Put a larger metal bowl on top and add 3 1/2 oz. of chocolate and the butter. Mix with a spatula or wooden spoon continuously. Remove the bowl from the boiling water when they are melted together. Add the rest of the chocolate, and beat vigorously with a spatula for a minute or two. Add the cocoa powder, sugar and instant coffee powder. Mix well and cool off in the fridge for a couple of minutes until it has gelled enough to spread on the dough. 5. Roll out the risen dough on a floured surface to a rectangle roughly 15” x 22.” Mark a line down the middle of the 22” side with the side of a spatula, not cutting through. On one half of the dough, spread the melted chocolate mixture and sprinkle the pistachios and salt over the top. Gently fold over the other half of the dough on top of the chocolate mixture and tap down gently to cover the entire half. 6. Make 2 cm marks along the folded edge, then extend lines up with the edge of a metal spatula. Separate each strip gently, and place on a lightly-floured surface. Twist the strips along the length, and then wrap into a spiral. Place on a baking sheet lined with parchment paper. 7. 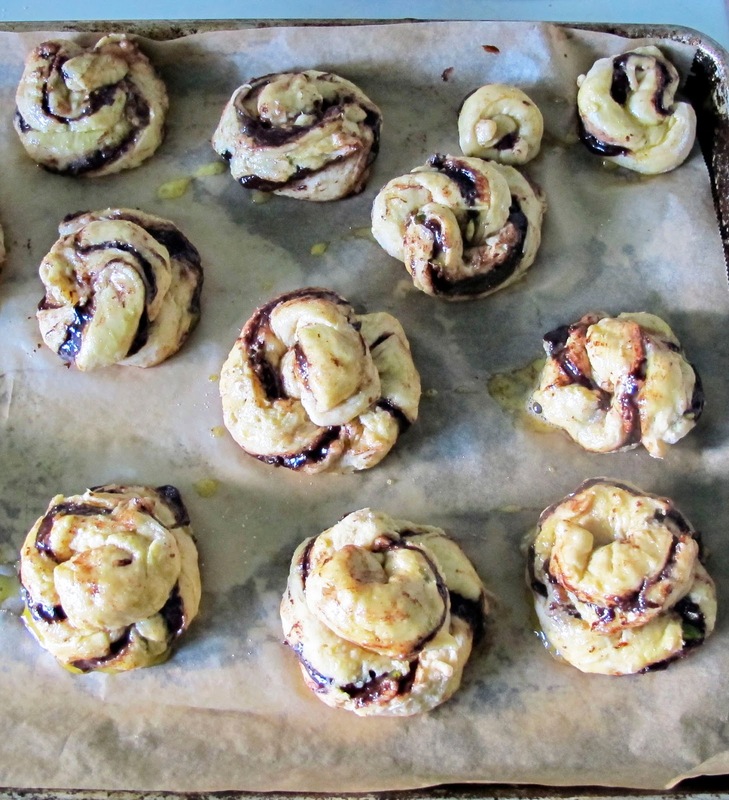 Cover the babka twists tightly with clear food wrap, and let rise for about an hour. 8. Preheat the oven to 350 degrees F. while the twists are rising. Bake for about 20 minutes until the buns are browned on top. Place the pan(s) on metal rack(s). 9. About 5 minutes before the buns are done, boil the water and sugar together for about 3 minutes. Remove from the heat and add the vanilla and lemon juice. 10. 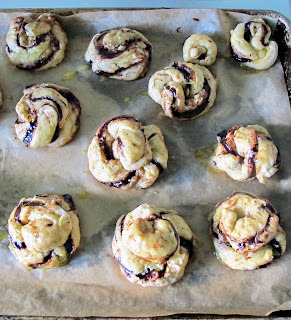 While the rolls are still warm, brush the buns with the glaze. Sprinkle the salt flakes and the lemon zest on top. Let cool down a bit and serve. Recipe adapted from Olive Magazine's recipe for "Chocolate and Salted Pistachio Babka Buns," link here. *Festivas: This noncommercial holiday as depicted on Seinfeld now can be celebrated anytime.